The imperforate stamps exist on thick rough paper or on thin smooth paper. Several shades of brown seem to exist. Perforated stamps exist (done with a sowing machine first and later perforated nicely 11 1/2). Rouletted stamps also exist. Remainders of the these stamps were sold with overprint 'Ungultig' (no longer valid) or 'BRIEF' (letter). In 1894 similar stamps in other colours were issued (see there). 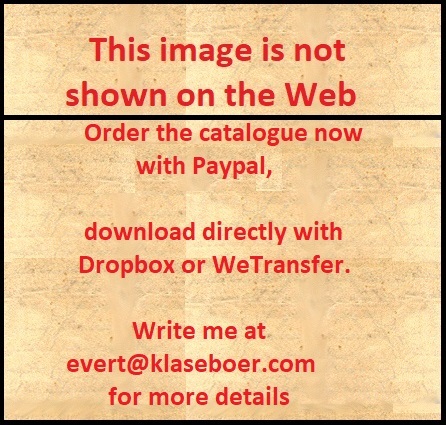 The imperforate stamps exist on thick rough paper or on thin smooth paper. Several shades of brown seem to exist. Perforated stamps exist (done with a sowing machine first and later perforated nicely 11 1/2). Rouletted stamps also exist. 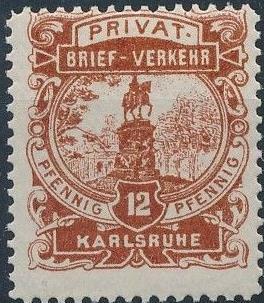 I have seen several misperforated stamps (see image above). Remainders of the 2 p orange and 3 p green were sold with overprint 'Ungultig' (no longer valid) or 'BRIEF' (letter). The paper is green, lilac, violet, yellow (two shades?) or blue. I've many imperforate stamps or stamps with perforation only on three sides. The text on this postcard reads: 'Karlsruher Privat-Brief-Verkehr Correspondenzkarte. A 3 p red misprint exists. The value 2 p red exist nicely printed with fat letters or printed less nicely with thin letters (the 3 p green was also printed in this fashion). 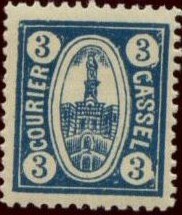 The stamps of Dusseldorf were also used in Kiel (2 p brown on green, 2 p blue on green and 10 p yellow on green). Slightly different types were used in Munster aswell as the stamps 2 p green and 3 p red (cancelled 'COURIER MUNSTER'). 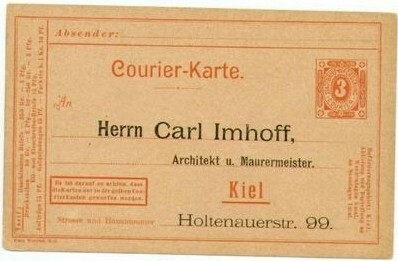 Some parcel stamps were issued by the Kieler Packetfahrt. I have seen the values 5 p green (see image above), 50 p violet (similar design as the 5 p) and a stamp with 'P' in the center (see image above) in the colour orange. They were issued around 1910.